While Rocky is ducking punches (and singing about them) uptown in the Winter Garden Theatre, the Working Theater has their own down on his luck boxer waiting in the wings. 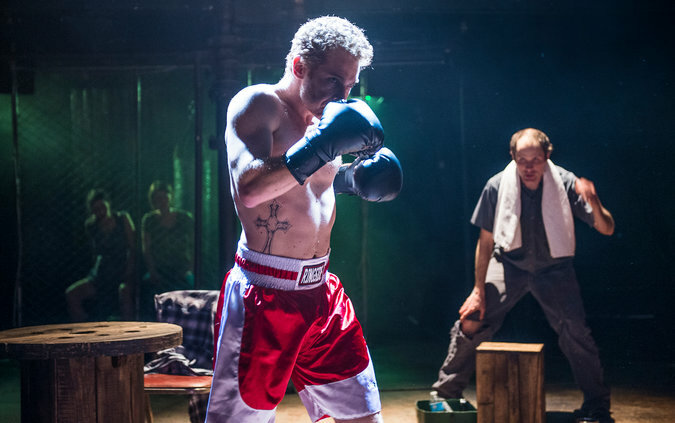 Cherry Smoke, now playing at Urban Stages, follows Fish (Vayu O’Donnell), a young man with a self-destructive streak as unyielding as his blows. He shares the stage with his girlfriend Cherry (Molly Carden), a runaway who hasn’t been in school in years; his younger brother Duffy (Patrick Carroll); and Duffy’s tomboyish-yet-maternal wife Bug (Julie Jesneck). As the plays goes through its assortment of flashbacks, present-day scenes, and direct address monologues, we learn about Fish’s troubled past and his attempts to change once Cherry gets pregnant with his child. As indicated in the play’s awkward prologue, where all four characters stare morosely into the audience before an abrupt blackout, Things Do Not End Well. Working Theater states that their mission “is to produce plays for and about working people.” I’m in love with this, as it can be grating to see another season of plays set in fancy sitting rooms. But Cherry Smoke, with its two-dimensional characters, seems to stereotype the people it wants to portray. Fish is a boorish alcoholic whose penchant for violence is vaguely explained away with “daddy issues.” Bug, who has a steady job and a loving husband, can only find fulfillment in being a mother (yawn). And Cherry is literally unable to survive unless her man is at her side. For a woman who has been living on her own since she was a child, her Ophelia-style breakdown is upsetting… and a little questionable. Finally, while the play’s violent end should come across as shockingly tragic, it instead reads as a foregone conclusion for its poor working class ne’er-do-wells. With downtrodden characters from beginning to end, Cherry Smoke fails to pack a dramatic punch. Its impact could have been felt, though, if we just knew what Fish was fighting for.